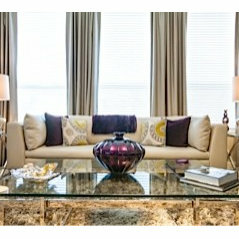 Pearl Design is an award winning design firm located in Houston, Texas. Pearl Design is superbly skilled in creating a breathtaking design that's a turn-key concierge level of services exceeding our clientele expectations while maximizing value without compromising quality. A project design can range from contemporary, minimalism, modern clean lines, or traditional-meets-modern-glam. Pearl Design roster of clientele range from professional sports figures, corporate executives, commercial and hospitality companies. In collaboration with our client, a design is developed that becomes the core or theme of the project. This design is enhanced by incorporating, surprisingly yet complimentary, accessories and other elements. Upon completion of the project design, our client is encapsulated in a luxurious space that is aesthetically appealing, functional, and reflective of their style. Pearl Design has been featured in national publications. Pearl Design has developed projects used for celebrity photo shoots. 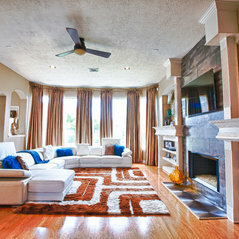 Typical Job Costs:We typically start at $20,000 to fully design and furnish a great room. We work within your budget to create a custom design that exceeds your expectations. Commented: Where can I find the geometric pillows on the bed, pls?Tracy these pillows are no longer in stock. Commented: Where is the coffee table from?Cantoni. Commented: Who is this toilet byDebbie Staton the toilet is by Toto. Commented: What is the style and color of the carpet?This is a custom shag rug and the color is ice silver. Commented: Can you tell me the details on the side table? Is the top made of glasYes the round side table top is black glass. Commented: DraperiesThe multi color drapes in the dining room are custom drapes designed by me. 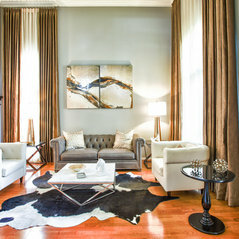 If you are interested in custom drapes and/or sheers for you home give me a call to schedule a consultation.